Somewhat lost in the hubbub over the various festivals and events happening these past few days was a press release posted on Oregon State University's website. The release announced that the papers of the late Fred Eckhardt have been acquired by OSU's Hops and Brewing Archives. Eckhardt's contributions to the craft beer movement in Oregon and beyond are well-known. As the release notes, he was an advocate, critic, mentor, educator, historian and more. He is quite rightfully considered one of the founding fathers of craft beer in this country. 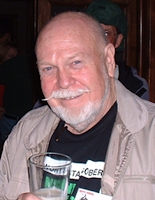 The papers apparently document Mr. Eckhardt's travels from the 1970s through the 1990s, the period in which he established himself as the dean of American beer writers. He spent considerable time visiting brewers and publishing his thoughts in articles and in several notable books. It isn't a stretch to say he pushed brewers to be more aggressively creative than they might otherwise have been. Adding Eckhardt's papers to the Hops and Brewing Archives means they will be available to researchers studying the formative years of the craft beer movement. This is significant because, as I discovered while researching Portland Beer, the early breweries did a poor job of recording their histories. It's hard to blame them. They didn't know what was going to happen. The papers of Fred Eckhardt will surely provide insight into what was going on behind the scenes in the early craft breweries. Hopefully, his gift will encourage others who have studied this history to share their materials. The materials I assembled while researching my book, including interviews, photos, news clippings and more, already live in the OSU Archives. For the unknowing, the Hops and Brewing Archives were established in 2013. It's mission is to preserve the history of hops growing and craft beer. This is apparently the first archive of its kind in the country. That make sense, I guess, given the proximity to hops growing and great beer. There's more information on the Hops and Brewing Archives website here. Besides research materials, they are actively collecting items connected to early breweries...things like labels, signage, promotional items, etc. These folks are doing great work and deserve whatever help we, as writers, authors, brewers, etc., can give them.